Get it? 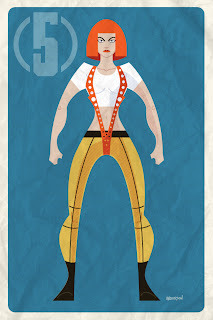 I took multiple passes at illustrating Leeloo... Ah, nothing beats a good(?) pun. This is for this month's Planet-Pulp topic, Femme Fatale. I might do more with these at some point, add some more design elements or something. For now, I'm just experimenting with a style that I'm thinking of using on another piece I'm developing for a gallery show later this year. It's always fun to push myself in new directions and try new styles.